The Michigan Tech Van Pelt and Opie Library is facilitating a student essay contest to celebrate Constitution Day, which will take place this year on Sunday, September 17th. Michigan Tech undergraduate and graduate students are encouraged to submit an original essay. In 600 words or less discuss these boundaries and the principles you would use in defining them. What is an example of a situation that might justify placing such limits on speech and/or on an organized march? What problems might arise due to such limitations? 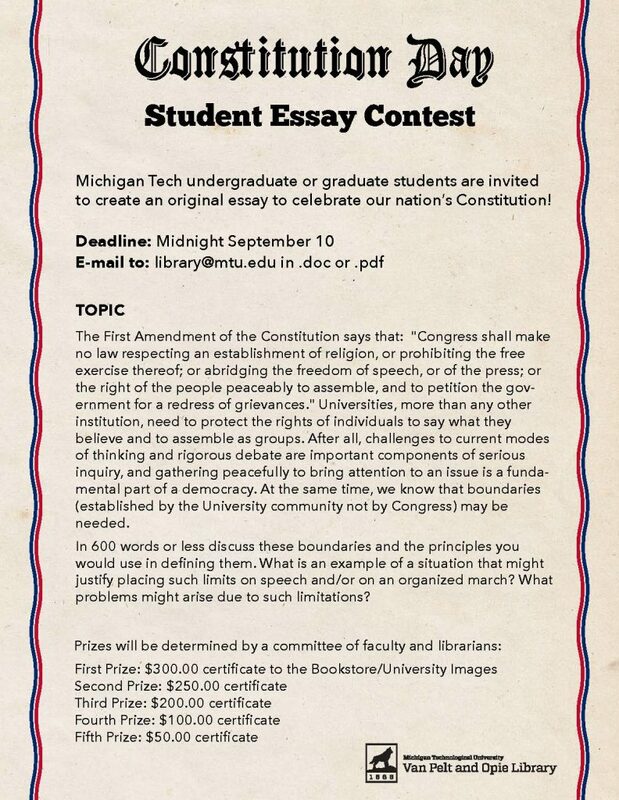 Essays must be submitted by email to library@mtu.edu in the form of a .doc or .pdf by midnight, September 10.